Sita Kaulesar Sukul, the Brown Paper Tickets Film Doer, is introducing a new service, actively promoting non-theatrical film releases. One of the current films speaks to the misrepresentation of women. Here’s Sita explaining a little bit about the film. The documentary Miss Representation premièred at the 2011 Sundance Film Festival, audiences were so riveted that OWN, the Oprah Winfrey Network, acquired its broadcast rights. 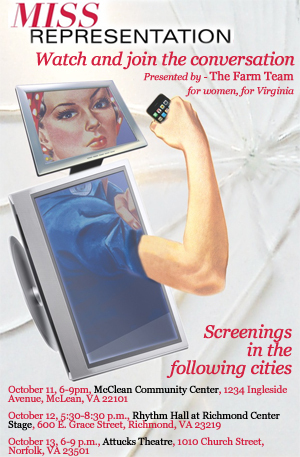 The film explores how the media’s misrepresentation of women has led to the under-representation of women in positions of power and influence. Sita, is our Film Doer here at Brown Paper Tickets and she’s put together an amazing film event in Seattle that will take place at the Northwest Film Forum on Capitol Hill this Saturday, April 2, 2011 with all proceeds going to benefit relief efforts in Japan. This event will feature the Seattle premiere of “Fine Totally Fine” directed by Yosuke Fujita.